We participate to the EU-funded STREP project "Phonon-assisted Processes for Energy Transfer and Sensing" (PAPETS). 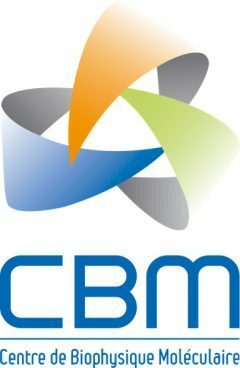 This project pioneers the emerging field of Quantum Biology in Europe and will focus on two problems. On the one side, we will investigate the functioning of light-harvesting complexes and try to elucidate how and why such complicated molecular machines appear to employ quantum coherence to achieve their stunning efficiency in harvesting sun light. PAPETS will also test a revolutionary model of olfaction, introduced in the 1990s by Luca Turin ( see his original paper), and holding great promise to unveil a formidable biological mechanism that still resists tenaciously to all theoretical explanations. The new mechanism posits that olfaction relies on inelastic electron tunneling. The main idea is that odorants would be recognized not through their shapes (lock-and-key recognition), but through their vibrational spectrum. The nose would thus act as a sort of nano-spectrometer. To investigate the role of protein vibrations in exciton transfer, we have introduced the Quantum Network Model, where a coarse-grained description of protein dynamics is coupled to a tight-binding Hamiltonian, whose elements are explicitly modulated by the classical dynamics of the underlying protein. This mean-field model realizes the so-called Ehrenfest dynamics. Despite surface-hopping is prevented by construction in this theoretical framework, we find that our model allows one to get considerable insight into how specific vibrational modes affect exciton transport. What are the structural and dynamical determinants of the astonishing ability of protein scaffolds to propagate mechanical perturbations from a given site to another precise, distant location? We employ different coarse-grained models of protein dynamics to study this problem, coupled with concepts and methods from statistical physics such as complex networks tools and linear response theory. We have discovered that proteins typically display normal modes that are strongly localized at multiple locations in the protein. We termed normal modes that possess two localization peaks bi-localized modes. We found that such modes express fold-rooted spatial correlations that effectively mediate long-range energy transfer. Interestingly, a study of several structures of G-protein-coupled receptors (GPCRs) shows that bi-localized modes typically exist in these structures, connecting pairs of residues at either end of the trans-membrane portions of the scaffolds. A special kind of many-body interaction emerges when one considers diffusive flux to multiple sinks. This theoretical framework arises for example when one wants to model diffusion-limited reactions among complex macromolecules or within complex environments. The origin of these interaction is simple: sinks tend to screen flux away from each other and therefore the overall flux (i.e. the overall rate) is reduced with respect to additivity. One thus usually speaks of anti-cooperative interactions. In order to solve such problems, we apply several advanced methods for the solution of the time-dependent and stationary diffusion equation in complex, multi-connected domains. These include, re-expansion theorems and dual-series relations methods. 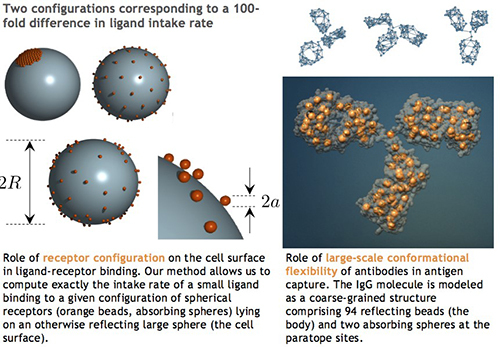 Recent applications of these methods include the calculation of the reaction rate constant of complex core-shell nanoreactors (collaboration with Helmholtz zentrum, Berlin), new insight into the role of receptor configuration on the cell surface in ligand-receptor binding and the study of how large-scale conformational rearrangements in antibodies modulate the binding rate of small antigens. Diffusive transport is well understood in dilute environments with simple geometry. However, naturally occurring milieux where this kind of transport is important are usually rather crowded and characterized by complex and strongly confining landscapes. The first striking example of this is the cell, the primary reactor for all biochemical processes at the core of life itself. Between 30 % and 40 % of the available volume in a cell is occupied by all sort of biomolecules, cytoskeletal fibers and a wealth of subcellular organelles. Order-of-magnitude and greater changes are observed in binding rates in vivo, often featuring subtle modulations that are hard to explain. Remarkably, an interesting picture is emerging lately whereby the interior of the cell would share many properties with the liquid state of matter. We are tackling these problems from various angles, essentially studying modified diffusion equations both derived from microscopic stochastic exclusion processes and from basic concepts of the physics of liquids. Recently, we have tackled the problem of how enzyme kinetics depend on the physico-chemical properties of the environment. To investigate this problem, we are performing enzyme kinetics experiments in the presence of artificial crowding agents, such as Ficoll (a highly branched polysaccharide), polymers such as PEG, small crowding molecules, such as glucose and mesoporous gels such as agarose. Furthermore, we are measuring the diffusion coefficient of reactants immersed in such complex media, using pulsed-field gradient NMR and Fluorescence recovery after photobleaching (FRAP). In parallel, we are running Brownian dynamics simulations with ultra-coarse grained models.